Zazen is a particular kind of meditation and part of Zen Buddhism. The aim is to reach enlightenment. In this practice, trainees sit with their legs crossed and their backs straightened (lotus position) as they meditate. The legendary Bodhidharma is the founder of Zen Buddhism and famous for Zazen. It is said that he practiced Zazen for nine years while facing a wall. In Kamakura, some temples provide the public with Zazen sessions. However, you don’t have to sit for nine years….just one hour. You are welcome to attend the session by yourself but if you need interpretation, I can accompany you and provide at least a minimal level of interpretation (so as not to bother the other attendants). I do not charge a fee for this service. 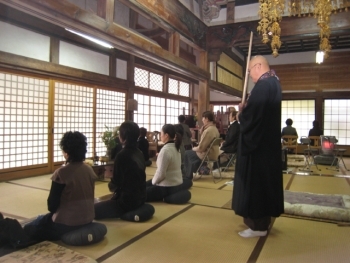 The following are two locations in Kamakura which offer Zazen sessions. Open Saturday from 1:20pm to 2:20pm year-round except for the first and last weeks of the year; the first week of March and September; and the month of August. Open the second and fourth Sunday from 9:00am to 11:00am year-round except for the fourth Sunday in July. The sermon, which you are supposed to hear before Zazen, is conducted in Japanese and lasts one hour (9:00am to 10:00am). The Zazen session takes place from 10:00am to 11:00 am. Open: Every Friday and Saturday from 5:00pm-6:00pm.